Peterborough's Trevor Swales (back right) and Ged Rathbone (middle right) at the speedway promoters annual meeting. Peterborough has a Championship club again . . . but this time it’s Panthers! The city’s speedway club will race in the newly-branded Speedway Great Britain (SGB) Championship in 2017. That is the new name for the second tier of the sport - previously known as the Premier League. The top flight is now the SGB Premiership with promotion and relegation between the two levels introduced. They are some of the developments pushed through during the three-day British Speedway Promoters’ Association (BSPA) annual meeting this week. Panthers were represented by promoter Ged Rathbone at the event held in Hertfordshire. The city outfit will have fewer rivals next season with the Championship boasting a maximum of 10 teams. That could be reduced to nine with concerns over the future of Cumbrian side Workington. Either way, the top four finishers will contest the play-offs with the winners of then going on to face the bottom Premiership club for a place in the top-flight in 2018. Recently-crowned champions Somerset and Rye House have both taken promotion to the Premiership. 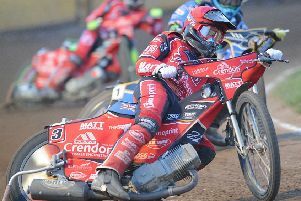 Last year’s Premier League format will now apply to both leagues with a tactical ride available between heats five and 12 to a team trailing by 10 points or more. All riders will now have one average, based on Premier League figures, for team building purposes with a 50-point limit for the top division and 40 for the Championship. It means riders who only raced in the Elite League last season will see their average multiplied by 1.4 to bring them in line with Premier League averages. The only difference in team building rules between the leagues is that Championship clubs must include a British youngster with a three-point average. And in a bid to help young riders get team spots, any rider who hasn’t achieved a three-point average will come in on a minimum of 2. No team changes will be permitted in either league after July 31. BSPA chairman Keith Chapman said: “This was probably the best AGM I’ve been to in all my time in the sport. “There was a genuine desire to try and change things and secure the future of league racing in the UK. I certainly think we have done that and I’m very excited about the months ahead. The season will start with the KO Cup competition and Panthers face Redcar in the preliminary round with the winners going on to face Scunthorpe at the next stage. The club will also stage the Championship Fours event at the East of England Showground. BRITISH SPEEDWAY LEAGUES FOR 2017 . . .
SGB PREMIERSHIP: Belle Vue, Coventry, King’s Lynn, Leicester, Poole, Rye House, Somerset, Swindon, Wolverhampton. SGB CHAMPIONSHIP: Berwick, Edinburgh, Glasgow, Ipswich, Newcastle, Peterborough, Redcar, Scunthorpe, Sheffield, Workington (subject to confirmation).